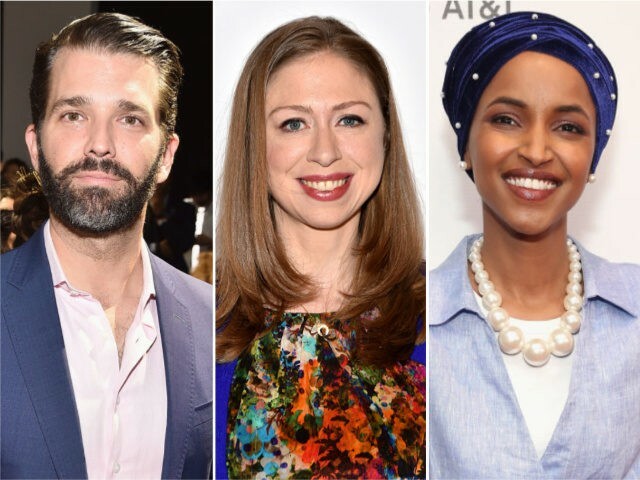 Donald Trump Jr. came out in defense of Chelsea Clinton on Saturday morning for speaking out against Rep. Ilhan Omar’s (D-MN) antisemitic remarks after New York University students accused the former first daughter of stoking Islamophobia that caused the terror attack in New Zealand. “It’s sickening to see people blame @ChelseaClinton for the NZ attacks because she spoke out against anti-Semitism. We should all be condemning anti-Semitism & all forms of hate. Chelsea should be praised for speaking up. Anyone who doesn’t understand that is part of the problem,” he tweeted. On Friday, video emerged from NYU students who confronted Clinton and blamed her for causing the terror attack in Christchurch, New Zealand, which left 49 people dead and dozens more wounded. Clinton was attending a vigil in New York to honor the victims when students berated her and recorded the confrontation. “After all that you have done, all the Islamophobia you have stoked,” a female student is heard saying. Clinton tried to deescalate the situation, but the students continued, with more joining in. Other students who were present began to snap their fingers, which is a sign of approval often used by college students. “I am so sorry you feel that way,” responded Clinton. Last month, Clinton had criticized Omar’s tweet suggesting that American politicians were paid to be pro-Israel. “It’s all about the Benjamins, baby,” the congresswoman had tweeted. After an opinion editor at the Forward tweeted, “Please learn how to talk about Jews in a non-anti-Semitic way. Sincerely, American Jews,” Clinton chimed in. “Co-signed as an American. We should all expect elected officials, regardless of party, and all public figures to not traffic in anti-Semitism,” Clinton tweeted. Breitbart News’s Alana Mastrangelo contributed to this story. You can follow Kristina Wong on Twitter at @kristina_wong. PoliticsantisemitismChelsea ClintonDonald Trump Jr.Ilhan OmarIslamophobiaNew ZealandterrorismTrump Jr.